This is the fourth part in a series of articles on Australian tourism in line with the current slogan, "Where the Bloody Hell Are You?" a campaign which has been gaining popularity among travel buffs who simply want an authentic Aussie getaway.— Ed. Beyond the Central Business District (CBD) of Melbourne, about 50 km away to the east, lie a picturesque valley where vineyards that yield the world's finest wines are neatly grown, pruned, and tended. The Yarra Valley Winegrowers Association estimates that there are over 50 wineries here. Not only gourmets and connoisseurs have come to a pilgrimage here, but also all kinds of travellers who have come from far and wide. 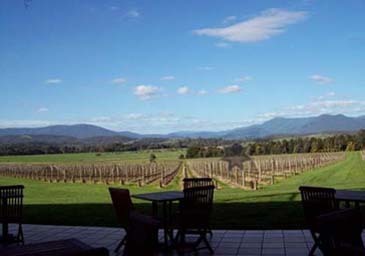 The Yarra Valley Information Centre promptly describes the region as a vivid reminiscent of Bordeaux or Burgundy in southern France, or the Tuscany region of northern Italy. Resplendent in the sunshine, the vineyards produce tons of white and red wines: Chardonnay, Pinot Noir, full-bodied Shiraz and Cabernet Sauvignon – all globally acclaimed for their excellent taste and top-class quality. If you have come to taste the wines from the open cellars, you've come to agree with what Dom Pierre Perignon, the famous French viticulturist and winemaker, said, "Come quickly, I'm tasting the stars!" Just as spring is springing in the southern hemisphere where an embroidery of pastel-coloured blosooms covered the hills, this is a perfect time to celebrate another season— toast to it with the finest wines! The Gray Line, one of the companies operating for day tours, was endorsed by the Tourism Victoria to lead this memorable expedition. With an energetic, witty, and humorous guide named Con taking charge of the steering wheel, the luxury coach takes off from CBD towards the route to the east plying past Richmond to the eastern freeway. The suburbs here are evident of old settlements with a random of vibrant commercial and industrial businesses. Claiming itself as the nation's sport capital, Melbourne's eastern districts also boasts of its world-class sporting venues, including the MCG— home to the national footy and rugby leagues, Melbourne Olympic Park, Lexus Centre, Vodafone Arena, Rod Laver Arena, Margaret Court Arena, the Oval, and the list goes on. The freeway led us to the approaching sight of Dandenong Ranges—a pristine forest which serve as Melburnian's handy getaway— only about 37 km in the east off CBD. Con said many of the old-rich who got fortune from the old Gold rush days had bought rest houses and other properties on the foot of the mountains. The ranges have been transformed into a national park covering a total land area of 3,215 hectares. Taking the Puffing Billy from Belgrade is an interesting part of the journey. But before hopping on to the Puffing Billy, our guide served his Billy bush tea in a clearing of the Sherbrooke Forest— few meters away from the train. Getting ready for the tea party with Lamington cakes and biscuits dipped in yeast-based Vegemites, he gave his guests some grains which they can feed on to the birds— straight from their palms. 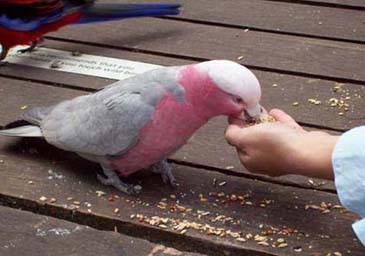 Delightful sights of colourful crimson rosellas, cockatoos, and king parrots swooped down to peck the grains, while some others landed on guests' crowns and shoulders. The birds here are just friendly. Puffing Billy is Australia's first steam engine locomotive in the 1880's. It billows gigantic smoke before it snakes through a pristine rainforest of fern and evergreen trees. The train is run by volunteers who never get a pay for what they do. All proceeds from its operation go to the maintenance of the train—to preserve the history of Australia's first steam engine. Puffing Billy is loved by children and adults alike. They can sit on the window and hang their legs out from the grill to fully enjoy the ride while scanning the cockatoos flapping and dancing above the trees like journeying through a magical forest. Puffing Billy runs to Emerald Lakeside Park for an hour and makes a longer trip to Gembrook for one and 45 minutes. 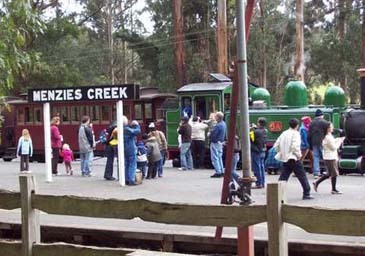 It makes a short stop at Menzies Creek— which has a steam train museum open on weekends and public holidays. The Emerald Lake Model Railway at Lakeside Park is the largest in Australia with more than 2 km of track..
After tea, our coach dropped us at the train. We were instructed to get off at Menzie's Creek Station where the coach will be waiting. Puffing Billy blasted off and everybody waved goodbye as if re-enacting the scenes of the old days gone by. As the coach was passing by the major towns of Lilydale, Healesville, and Yarra Glen, gardens of daffodils and roses, as well as large farms of strawberries by the roadside were suffused in the sun. There were ubiquitous sights of B&B nestled on the foot of the hills. Here are the secluded hideaways of schools, companies, and even church groups for workshops, seminars, retreats, and camping. It was noon when our coach was entering Yarra Valley— a breathtaking sight of vineyards is spread out before the eyes. Standing by the gate of Fegusson's Winery is a small wooden church decked with a bell tower. The church welcomes guests to the vineyard, as it also beckons grooms and brides-to-be to come and exchange memorable matrimonial vows set against a lovely vineyard. 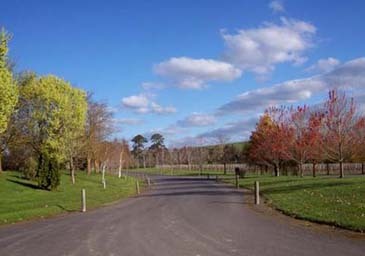 The Fersusson's, a multi-awarded winery, is the host to a sumptuous buffet lunch made up mainly of gourmet's roast beef or fish matched with fresh garden salads. Fine dining is complemented by white or red wine on the dining table. The romantic ambience is intensified by solid wood timber around adorned with cathedral ceilings above. There's an open fireplace for roasting on the other side, and the glass walls around provide a view of the spectacular vineyard. The lunch provided an opportunity for guests to share the dining table. There were smiling faces from South Korea, and Sta. Barbara and San Francisco in California, USA. We shared the one dining table as we briefly exchanged a bit of friendly conversations and interestingly, we found a common ground appreciating the sceneries around. The vineyard was planted 1968 by Peter Fergusson, an accomplished viticulteur and wine maker which was eventually joined in by his wife in 1985. The first commercial vintage was processed in 1973 and subsequent expansion added the restaurant in 1975. The wine sales facility opened to the general public in 1978. The vineyard is planted to classic French grape varieties. For white wines, Fergusson has Chardonnay, Semillon, and Sauvignon Blanc, while Pinot Noir, Shiraz and, Cabernet Sauvignon are for reds. Gray Line fired up the excitement to a new height when it's time to head for the Rochford Wines'vineyard, another multi-awarded winery on the state and international level. A private room has been waiting for us to taste an array of exquisite wines of various varieties: Riesling, Sauvignon Blanc, Chardonnay, Pinot Noir, Merlot, Cabernet Franc, Cabernet Sauvignon, and Shiraz. 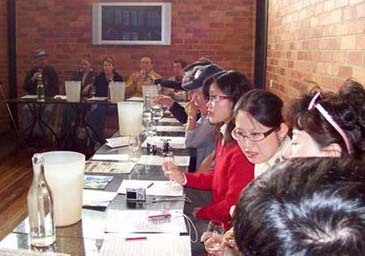 Guests took their seats as the host gave a briefing on the art of wine-tasting. Pouring a sample 2005 Chardonnay on each wine glass, the host instructed her guests to lift the glass. As wine is meant to arouse the senses, she taught guests how to smell the aroma—once or twice. She let the guests fill in their mouth with wine, play it between the teeth, circulate it to the left, to the right, and up before letting in through the throat—to allow the full flavour to linger on. Time was running quick; it was almost 4 pm when we took the tour to the Chandon Estate, recognised as producer of Australia's benchmark premium sparkling wines. About 4 million bottles of sparkling wines carrying the prestigious brand name of "Chandon" are produced here every year. Chandon's guide toured us around the wines' processing and fermentation plants. He explained how the wines undergo a long and tedious yeast ageing process to produce wines with incredibly soft, sweet, and crisp finish. Domaine Chandon Australia grows Chardonnay, Pinot Noir, and Pinot Meunier grapes. After completing the tour, our guide hosted a sparkling wine tasting in its restaurant overlooking its vineyard: Chandon Vintage Brut 2003 and Chandon Cuvee Richee. Domaine Chandon Australia was established in 1985. Since 1960, wineries have been planted in Argentina, Brazil, California, and Spain. The expansion of business to the Yarra Valley has historical viticultural significance. The area earned its wine reputation over last century for the production of premium table wines which won many Grand Prix prizes in Europe. Elated to a blissful height inspired by wines amid an awe-inspiring vineyard vista, the sun was turning into gold on the western sky. We took the last gaze over the wide plains and hills as if inscribing in memory a brief moment of eternity. We boarded on the coach back. Some might have been tipsy as they wanted more wines. Con asked his guests if we would like a sing-a-long on board. He rehearsed aloud the lyrics so that his guests can catch up with the song before he turned on the stereo sound— as we found our feet tapping to the tune of an Aussie's country music. Yes, Yarra—from the aboriginal word, "ever-flowing," has been a part of such a memorable day.